Item description: Letter from Elisha Franklin Paxton to his wife, Elizabeth, dated 26 December 1861. 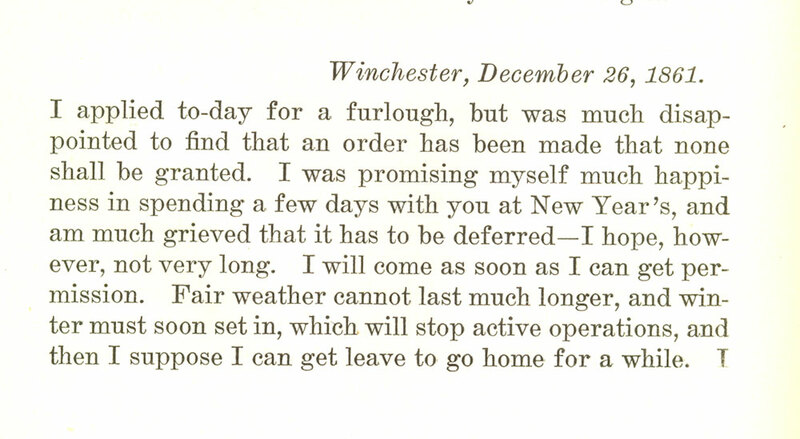 In the letter Paxton informs his wife that his hoped-for furlough would not come through in time for him to visit around New Year’s Day, but that he may get leave once “active operations” ceased due to winter weather. I applied to-day for a furlough, but was much disappointed to find that an order has been made that none shall be granted. I was promising myself much happiness in spending a few days with you at New Year’s, and am much grieved that it has to be deferred — I hope, however, not very long. I will come as soon as I can get permission. Fair weather cannot last much longer, and winter must soon set in, which will stop active operations, and then I suppose I can get leave to go home for a while. I will make this note short so as to try and get it in to-day’s mail. Your box just came to hand as I left the camp this morning, for which accept many thanks. Good-bye, dearest. Item citation: Paxton, Elisha Franklin. Memoir and memorials: Elisha Franklin Paxton, Brigadier-General, C.S.A. ; composed of his letters from camp and field while an officer in the Confederate Army, with an introductory and connecting narrative collected and arranged by his son, John Gallatin Paxton. New York: The Neale Publishing Co., 1907. This entry was posted in Uncategorized and tagged camp life, Elisha Franklin Paxton, furlough, love letters, soldier conditions, Virginia, Winchester. Bookmark the permalink.